Follow up strategies help redouble your efforts tactfully. How many times should you follow up after a pitch goes unanswered? Chances are, more than you do now. Here's how to redouble your efforts--tactfully. I once sent a pitch to a former client. I hadn't worked for this client in several months, but she paid well and I was eager to get another piece of business. I was certain I had a proposal she would be interested in. But my contact didn't respond to my first email. Or my second one, a couple of weeks later, or my third, a couple of weeks after that. We had a strong history together and I really wanted to work with her again. And so, instead of my usual practice of giving up after a couple of tries, I kept at it. After yet another email went unanswered, I called her office and left a message. A week later, I left a message again. (I was feeling more and more like a stalker, but I really wanted the job.) A week after that, I called one more time--and she happened to pick up the phone. She hadn't read or didn't remember my emails or phone messages, so I explained once more what I had in mind. "That's interesting to me," she said. And gave me the job. As soon as I got off the phone and got done whooping for joy, I pulled out a little yellow sticky note. "Persistence pays!" I wrote with a red felt tip, and stuck it to the side of my computer. For years--until I changed computers a couple of times and the stickum wore off--that little note stayed in place as an important reminder that what can feel like obnoxious pushiness might actually be the appropriate behavior needed to get a customer's attention in this busy world. It's a lesson I've often forgotten, but when I've remembered and made the effort to follow up and then follow up again, I've rarely been sorry. More than once, it has led to an unexpected sale. On the other hand, as someone who receives a lot of pitches, and more than my share of follow-up emails and phone calls, I know that there are effective ways of doing it and ways that will only annoy. 1. If you haven't followed up, you haven't really pitched. This seems like it should go without saying. But too many people will send one email or leave one phone message and never get in touch again if they don't get an answer. If something's worth going after, it's worth trying more than once. 2. Follow up at least two times more than you think you should. In another case, I sent a pitch, then one follow-up, and then gave up. Four months later the customer got back to me--very apologetically--to ask if I was still interested. I was, and that company has since become one of my best clients. It was sheer dumb luck that this particular customer remembered my pitch or else found it again in her inbox. If she hadn't, I would have missed a really good thing by giving up too soon. 3. Assume your customer has forgotten your pitch. You'll have the best chance of success if you figure on starting over from scratch every time you get in touch. 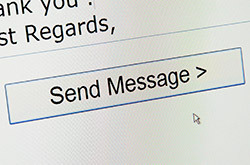 If your original proposal was an email, include that email in your follow-up. If you have a prospect on the phone, or are leaving a message, remind him or her in as few words as you can what you proposed. 4. Don't act like you're owed anything. It can be tempting to get peevish the third or fourth time you've followed up and gotten no response. Keep in mind that no matter how many times you've gotten in touch or how perfect your offer is for that client, no one there is obligated to respond to you in any way. Your fifth follow-up should be as polite in tone as your first one was. 6. Your objective is an answer. But some people are uncomfortable saying no, so they'll try to put off the inevitable. Fight that tendency by giving the person a reason to give you an immediate answer, such as a limited-time discount. And if your contact says something like "I'll get back to you," set a time when you'll get back to him or her instead. What happens if and when you get that "no"? Have an immediate plan. What other customer can you pitch to next? What other product can you pitch to this client? Getting turned down should just take you to the next step along your planned path. By the way, you should also know what your next step is if the answer turns out to be yes. Whatever answer you get, someone took the time to read your proposal, or speak with you on the phone. They gave you some of their time and attention, which is a scarce commodity for every professional these days. They may have given you information that can help you make your product better, or some ideas about how to sell it elsewhere. And if you thank them, they're likely to remember how gracious you were--and want to do business with you in the future. Minda Zetlin is a business technology writer and speaker, co-author of The Geek Gap,and former president of the American Society of Journalists and Authors. The millennial generation values user-generated content above all else. Today’s entrepreneurs can learn a lot from Mozart, who continued to create even as he dealt with a stormy personal life and destructive financial pressures.